happy with a little grazing time. The fox family that lived outside of our fence a few years ago gave me all kinds of wonderful reference shots to use as inspiration for paintings. I finally got around to painting this view of them all relaxing in the sun in our own backyard. I love to paint foxes with their flighty personalities and wonderful coloring. More to come on this subject for sure. This one greets visitors entering the art gallery area at Belle Meade this year. It is a 10 x 20 framed oil that is framed in an Italian wormwood frame. A huge THANKS to everyone that came out to the opening last night at Belle Meade's art gallery. I sure do appreciate the support of each and every one of you who took time out of busy schedules to attend! I have to share a fun story of what happened in the middle of the evening. Last week I posted the image of the painting titled “Iroquois Rain Gear” which appeared on the show’s postcard invitations that went out to Belle Meade's mailing list. A person who received the card thought she recognized the women and asked her daughter, “Don’t you know these women?” Yes, she did and passed the invitation onto the person in the red dress! 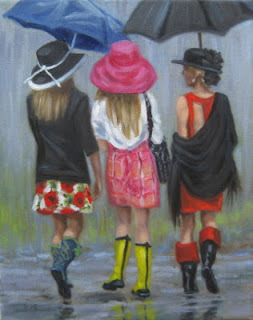 So, she in turn decided to gather her two friends and dress in the exact same outfits as they had on at the Steeplechase in 2011, boots and all. We never met each other that rainy day that I snapped the photo reference. Because of the rain I didn't want to make them stop and talk etc...so I had no idea of the identity of my subjects. They arrived as a surprise at the opening last night! And surprise they did.... It was a really fun moment. I can’t stop smiling thinking about it! Thursday, June 7th is the opening date for my solo exhibition at the visitor center art gallery at the Belle Meade Plantation here in Nashville, TN. Come on over for some summer wines provided by West Meade Liquors and some light hors d' oeuvres from 5:30pm. to 7:30 pm. I'm always excited to show here at Belle Meade. The people I work with there are a delight and a portion of all sales goes to the ongoing restoration and education projects at this most historic site. 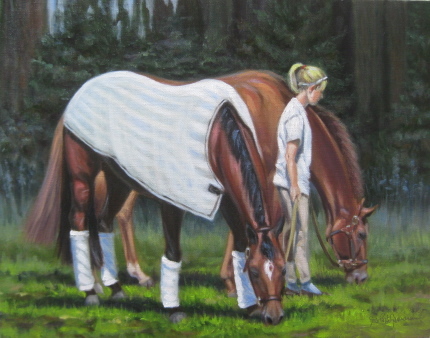 Considering Belle Meade's important place in thoroughbred breeding history here in the US, my equine centered paintings fit well there and I appreciate their support in showing my work now for the third year. This year there will be paintings inspired by the steeplechase, the event of the Middle Tennessee Pony Club, Foxes, wildlife and various related themes. The show runs through July 28th. After it opens...I'll start posting selected paintings on this blog so those of you who can't make it down to Nashville in the next two months can see the latest ! The painting shown here is called "Iroquois Rain Gear", an 8x10 oil. When I am shooting reference shots at the Iroquois Steeplechase, I force myself to occasionally turn from the gorgeous horses and stay on the lookout for some of the attendees in their spring finery. Last year it was a rainy, grey day ...but that never stops true steeplechase fans, they just don their boots and go along like the weather doesn't matter!